Fans agree that the show lives up to its tag line "the happiest antiques show on Earth." And early on, it caught national attention. Attendance increases every year. In the past couple of years, more than 20,000 shoppers have visited the show during its two-day run. Demand to become a vendor in the juried event is so high that spaces for next year will be full by July, or sooner. For 2016's 14th annual Farm Chicks Show, Thompson expanded to the fourth and final bay of the fairgrounds main exhibit hall, filling all available indoor space at the venue. That weekend, more than 170 vendors set up shop, many taking up multiple vendor stalls, across the 90,000-square-foot exhibit halls. The majority of them are based in the Pacific Northwest, though Thompson doesn't actively recruit any vendors. "What happens is a lot of people come to the show and they get really inspired by this, so they get together with family and friends and apply. That's how I find them," she adds. In the weeks leading up to Farm Chicks, vendors at Spokane vintage shop Boulevard Mercantile begin to feel the hustle. On an afternoon several days before the show, one of the shop's 10 vendor-space renters is "blowing up her space," and piles of old stuff are everywhere. "We had a vision for a vintage store that wasn't an antique mall," Webb says. "And we wanted to surround ourselves with good people to fill that space." "We knew we needed to have painted furniture, but we wanted to make sure that we had good painted furniture, and we didn't want everyone to have the same stuff in their space," Jeffers chimes in. "We wanted it to be diverse so there was something for everyone." 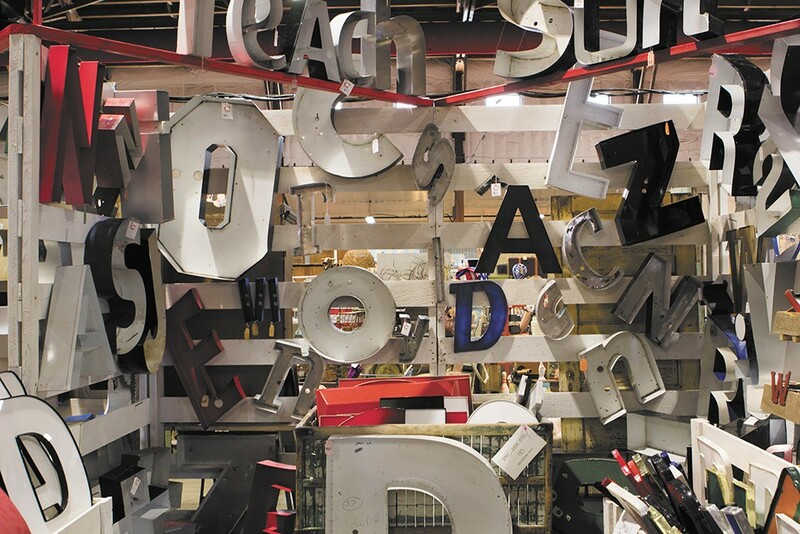 The resulting collection of vendors and artisans at Boulevard means shoppers can find rustic and industrial pieces — signs, bins, buckets, farm accoutrements, etc. — along with original furniture from all eras, and even some vintage clothing and locally made, original artwork. Farm Chicks weekend means double duty for Boulevard Mercantile's owners and sellers, as they'll fill spaces on the show floor (doing about two month's worth of sales in just two days) while making sure the shop is filled with treasures of equal quality. With so many out-of-town shoppers here during show weekend, brick-and-mortar vintage and antique retailers must prepare for an influx unlike any other time of the year. Boulevard will add extra hours on Saturday evening and Sunday, a day it's usually closed. In downtown Spokane, it's the same for the 18 sellers at Chosen Vintage (formerly Roost). 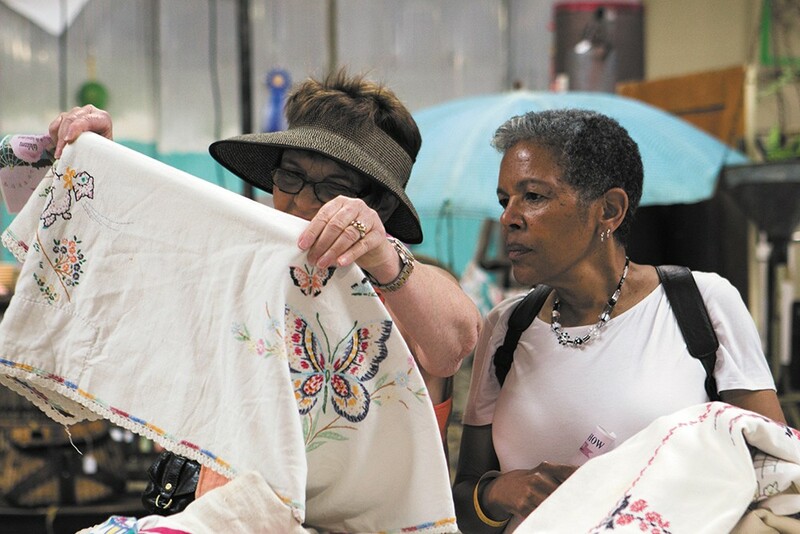 Several of those vendors pack up extra wares to head to the fairgrounds, while others don't; instead taking advantage of an influx of shoppers in town for the show who also hit up the permanent vintage shops around town. "Farm Chicks throws a lot of business to us," says Jean Corder, who sells there under the shop name MagPye. "People load up at Farm Chicks, and then load up here. It's really impacted the thrifting and flea-market scene drastically. [Spokane is] a destination for it now." Thompson is glad to see how events like hers and others — there are many local, annual events in the same vein as Farm Chicks — may have directly influenced the growth of our region's vintage and antique shopping scene on a more permanent level. "So many people are coming here, and what's amazing is that people think of Spokane as this great vintage area," she says. "We have such an opportunity for everyone to grow, and I really can't wait for that." The market for vintage and antique goods has always existed, though not quite on the same scale it's now reached. Whether influenced by do-it-yourself TV shows on HGTV, bloggers and lifestyle magazines or events like Farm Chicks, decorating one's home with a combination of old and new has developed a mass appeal. Soriano, the former Country Living editor, says vintage home décor themes have never gone out of style. "What we're seeing now is this mashup of modern design with vintage design, and I think that's given it a much broader appeal," she says. Thompson agrees, which is why she strives to make sure Farm Chicks offers a varied mix of vendors who sell wares across the style spectrum of vintage and antique goods — from the shabby-chic, "chippy paint" look to more primitive and rustic farmhouse themes. "You might not have a lot of vintage, or maybe you dabble with it, but you can just put one great piece out and it adds so much warmth," Thompson explains. In search of little treasures at the Farm Chicks show. At Chosen Vintage, Corder says she's constantly asked by buyers if she knows where a piece came from, what its history is. Sometimes she does, while other times it's anyone's guess. Boulevard Mercantile owner Jeffers believes one reason Spokane and its surrounding areas seem to have such a wealth of quality vintage finds is because the area was home to several higher-end furniture stores in the mid-20th century. Now, many lifelong residents who've owned a quality piece for decades are ready to let go, so these durable, mid-century sofas and other pieces are coming out in greater numbers. Jeffers personally tends to focus on finding and reselling items from that particular era at Boulevard. "People like things that are functional, and they want things that are affordable and that are authentic and have a story behind them," adds Webb. "Spokane just happens to have a lot of stuff, a lot of old stuff, and it's all coming to the surface." Perhaps it all goes back to our regional setting — a diverse natural landscape, with roots dating back to generations of hardworking pioneers in farming, mining and industry — adding an extra layer of sentimentality when we dig up these old pieces that then become centerpieces of our homes. "It feels authentic, not just something we're doing that is trendy," Thompson muses. "People live in places like this, like Green Bluff, and we have more roots to this lifestyle in which some of these pieces originated." • Only bring the necessities with you (wallet, keys, phone), and don't forget empty tote bags or a collapsible shopping cart to carry your newfound treasures. • Go with family and friends, but don't feel the need to stay together as you shop. There's so much to see! • If you do like crowds and want to be first in, a line starts forming hours before the show opens; bring coffee, and camping chairs to stake your spot. • Remember that during the show weekend, many of the area's brick-and-mortar vintage/antique shops bring out their best stuff, too, and add extra hours. Northeast Washington Fairgrounds, Colville, Wash.